“George Saunders has written the best book you’ll read this year.” That was the title of a New York Times magazine article last month about a man widely recognized as a master of the short story genre. Saunders won a MacArthur “Genius Grant” in 2006, which comes with a $500,000 prize. He continues to teach writing at Syracuse University and plug away at his stories. He’s not prolific; he writes on average two stories a year, and one story in his new collection took 12 years to finish. Join Diane as she talks with George Saunders about his unconventional path to becoming one of America’s most celebrated writers and why he loves short stories. 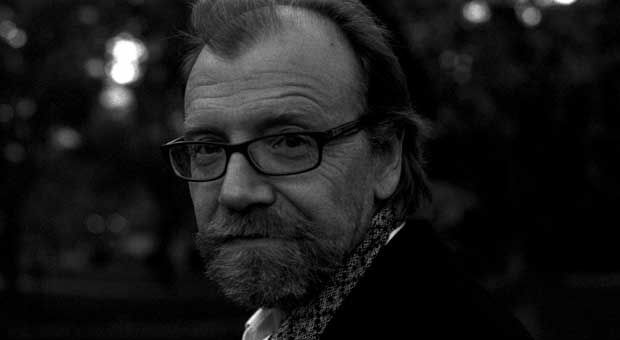 George Saunders Author, MacArthur "Genius Grant" fellow and creative writing teacher at Syracuse University. A: The one writer I go back to again and again for inspiration is Nikolai Gogol – especially “The Nose,” “The Overcoat,” and “Dead Souls.” I don’t know why except that these stories are so insane and compassionate and impossible to categorize – they’re funny and a little mean and then again full of love. A: I think we may have talked about this a bit at the end. Basically, I picked it just because I love the sound of that phrase. I try not to invest too much metaphorical of extra-textual meaning into titles of character names and so on. As for your father – God bless him, and you. A: It’s a great point. I think nearly every writer has that struggle. I have a lot of political and ethical and spiritual ideas but I’ve found that stories aren’t a very good vehicle for expressing those – sort of like making a hammer out of Jell-o. It seems to me that you have to really see what the story wants to say, and to honor the situation and people you are making. The great danger is that the writer will (in his quest to express his ideas) overpower the actual energy of the story – and in so doing, will fail to be interesting. He’s just backed the big manure truck containing His Ideas up to the reader and let it rip. Which is sort of static and condescending – doesn’t take the reader’s experience into account, we might say. Maybe the trick is to lose the notion that you are writing your story to express an idea, and embrace the notion that you don’t quite know why you’re writing. Or: you’re just trying to get some truthful and undeniable energy into the prose, and tell a story that is compelling. There’s a sort of naughty saying attributed to the poet Gerald Stern, which I use often because it’s so perfect, and which I’ll clean up here. He said: “If you set out to write a poem about two dogs making love, and you write a poem about two dogs making love – then you wrote a poem about two dogs making love.” (And that last bit should be said in a disappointed tone.) His point is that a work of art that too neatly satisfies the expectations it sets up early, will actually be a bore for the reader (who got those expectations and was expecting more – surprise, escalation, deepening). I think the thing to avoid in writing is condescension – this idea that the reader is a passive recipient of whatever it is the writer wants to administer. A: I think that was William Styron, and that gets it perfectly. Thanks for that, Odette. Paris Review [Plimpton]: How much rewriting do you do? Hemingway: It depends. I rewrote the ending to “A Farewell to Arms,” the last page of it, 39 times. Paris Review: Was there some technical problem there? What was it that had stumped you? A: Yes. And he got most of them right, I’d say. But this is interesting – it’s a timeless problem, when a writer tries to talk about his process. I think it’s because writing is maybe more akin to playing a sport or improvising on an instrument – lots of intuition and iteration and adjusting-on-the-spot. We tend to think of it as an intentional and intellectual process – the writer has an idea or a plan and just executes it. And this is how we talk about it, mostly. It’s some version of what’s called “the intentional fallacy” – this idea that the writer has an intention and executes it. But in my experience, that way of talking has a little built-in falseness. Hemingway is doing a very neat evasion there…very smart. A: Randall, yes, I think you’re right. I often remember the old engineering idea that, when starting an experiment, you don’t care how it turns out – you just want to run the experiment honestly, and see how it goes. Same with stories – you might start out with some direction in mind, but woe betide you if you ignore the ‘experimental evidence’ (i.e., the actual energy of the story) . The other deep benefit for me of my engineering education was the idea of rigor. At the Colorado School of Mines, where I went, you were taught early that effort was necessary but not sufficient – didn’t matter how long you studied, if an answer was wrong, it was wrong, and that was that – great training for writing, actually. If you’ve done 200 drafts and it still stinks, too bad. Go do 201. Argh. A: There isn’t, really – I have two essays I did for GQ that haven’t been published yet – one about a trip I took to Africa with Bill Clinton, and one on an experience I had living incognito for a week in a homeless tent camp in Fresno. But for the foreseeable future I think I’m going to just keep working on fiction – life is short and art is long , etc., etc, and I haven’t found anything as enjoyable as stories. As for drones – well, yes, I have some thoughts on drones. If you haven’t read it, you might have a look at the late David Foster Wallace’s essay on the war on terror – I think it’s called, “Just Asking.” In that essay, he basically says (as I read it) that it might be more heroic and brave and judicious to just accept that we will have a certain number of casualties due to acts of terror than it is to sacrifice our basic moral principles (by torturing, violating due process, etc.). A bold idea, as so many of his were. My guess is, he would have included these drone strikes in that list as well. Feels to me like there’s been this weird and sad slide into a very scary moral place, where (1) pragmatism justifies everything and (2) we have really forgotten to imagine the viewpoint of the innocent victims we are always making in these sorts of things and (3) war has become more a corporate move than a military or civic one – we just farm it out. And our logic gets wonky: instead of feeling, “My God, war is the absolute last resort, used only when completely necessary to forestall invasion,” we now seem to always be asking, “Would now be a good time for a war?” We’re like some tough drunk guy outside a bar, always looking for an excuse to throw a punch. And then people with any pacifist tendencies (i.e., good sense) are put in the position of having to make the case against war. I said in an essay that the war in Iraq was a failure of literary imagination – we failed to fully imagine the forthcoming casualties and the effects of our actions. I think we’re still doing that – exposing thousands of our young people and Afghani people to so much violence. I know the Taliban’s no picnic and so on – but it disturbs me that over here life goes on as normal while so many people are mired in violence and aggression. Violence is toxic – all of the great sages have said so. It scares and saddens me that we’ve slid over into this space where some very violent acts and attitudes have become commonplace, and acceptable. So – if we can imagine the experience of some kid at a wedding or village gathering as the drone controlled from Langley comes over and fires a mistaken rocket – well, I think we should do that. It’s real. It’s as real as anything said on some talk show about expediency and so on. It’s as real as the death of a “high-value target.” What terror that kid must feel, and what rage. I’m not really all that political a person – my logic is too vague and I spend all of my time on writing and teaching – but I do think we have to be honest. That is, we have to remember that kid and hold his/her experience up very rationally against the importance of killing that “target.” They both deserve to be in the argument. A: You bet, 100 percent, a totally honorable impulse. I think what she’s showing you is dedication and pride in her work. Bravo to Susan’s daughter, I say. And bravo to Susan, for being thoughtful enough to ask the question. A: Hi Joane. That is really wonderful. Congratulations to your granddaughter. I think there is nothing as empowering as written language. We can use it to grow ourselves outward, to communicate subtly nuanced ideas that we could never speak, to become more empathetic, to stand up for ourselves and others. So great that your granddaughter is being supported in this. But I do think you should get started on YOUR book. Put it this way: if you sit down for 10 minutes a day, even if you don’t write a word, then you’ve begun writing your book. That’s why we call it “process.” Even just sit by the window and think about writing your book – and you’re already writing it. Might be a great start to just imagine yourself telling that talented granddaughter of yours what life was like for you when you were seven. I bet she’d love to know. A: Thanks, Jhana. One idea that gives me a lot of comfort – and I’m aware it sounds corny – but I like the thought that any of us could find a sort of fictive corollary, in our minds, for any other of us. That is to say, since one person’s brain is actually very physically similar to any other brain, and because the neurological processes are similar, we are more alike than we might think – and fiction (reading or writing it) is a way to remind ourselves of that fact. When Tolstoy describes childbirth in “War and Peace,” any of us who’ve been through that get a weird jolt of recognition. And what a weird thing that is – some guy who died over 100 years ago is causing intense activity in your brain. Magic, really, and hopeful – since that implies that deep & profound understanding of another’s motives and feelings is not only possible, but probable, if we just lean into it a bit. Excerpted from TENTH OF DECEMBER: Stories by George Saunders. Copyright © 2013 by George Saunders. First published in the New Yorker and excerpted by permission of Random House, a division of Random House, Inc. All rights reserved. No part of this excerpt may be reproduced or reprinted without permission in writing from the publisher. MS. DIANE REHMThanks for joining us. I'm Diane Rehm. The title story of George Saunders' new collection of short fiction seems at first to be all about dying, but as with many of Saunders' stories, it's replete with surprises. Goodness and humor can almost always be found lurking in the darkness. Saunders exposes just how awful human beings can be without making us feel we live in an evil world. Awarding a Saunders a Genius Grant, the MacArthur Foundation called him a sharply observant, highly imaginative author who's influencing a generation of young writers. His new book is titled "Tenth of December." MS. DIANE REHMGeorge Saunders joins me in the studio. I hope you'll join the conversation as well. Call us on 800-433-8850, send us an email to drshow@wamu.org, follow us on Facebook or send us a tweet. Good morning to you. MR. GEORGE SAUNDERSGood morning to you, Diane. SAUNDERSIt's perfectly reasonable parenting. No. That -- my childhood was the opposite. It was very free. But in our neighborhood there was a family that had this system of major and minor treats. On each day of the week for some reason, they were allowed certain treats if they behaved well. So they became sort of source of fun for us, because one of the younger kids who didn't know it was sort of embarrassing would say, Ray, it's Tuesday, it a major treat day. SAUNDERSAnd the older kids would be petrified -- or, you know, mortified. But they all turned out really, really well. So I think part of this, for me, part of the fun of fiction writing is to try to inhabit somebody else's mind, and the weird thing is, you always have some aspect of that person in you. If you're imitating a 15-year-old girl, you can find her. If you're imitating a 97-year-old bitter ex-convict, you can find that person. SAUNDERSSo part of the craft for me is to, through many, many revisions, start out with a character of somebody, and then over the months start to feel them actually rising up from inside of me. REHMHow about imitating someone who may be dying of cancer? SAUNDERSYou know, that -- I just the -- I heard of someone who was in that situation and, you know, David Mamet says that the fictional impulse is partly related to daydreaming, that sort of spontaneous daydreaming that we do when we, you know, when we think of what we should have said, or we imagine being at our own funeral. And when I heard about this protracted illness, I just got the feeling of recoil, like oh, I don't want that to happen to me. SAUNDERSAnd then another microburst of thought which was, well, if it does, I'll get out of it. And then, really, how are you going to do that? And then I had this idea -- I think I'd been reading "Into Thin Air," or maybe Jack London, this idea that if you go and freeze yourself to death, that's painless, which I'm sure is not really the case. But sometimes ideas just come in those quick, literally, like less than a second sort of mental projections that we do almost automatically. REHMAnd then what you do with them? Do you write them down? SAUNDERSSometimes -- and that one I didn't. That one I just sat on it for about six or seven months, and all it was was, what if. What if this -- what if I decided to end my life that way? And it's interesting because that's where plot comes from because once you say what if a guy tries to end his life, then your job is to kind of create obstructions -- natural obstructions. So if he just does it, that's not a story, it's an anecdote. But if goes to do it and is interrupted, suddenly then you get into some interesting turf. REHMHow long did it take you to write that story? SAUNDERSThat was about a year maybe, not including the think time before. REHMWhy do you think it takes you that long to write a story? SAUNDERSI think it's because part of the job of the writer is to sort of out yourself for your two simple ideas. You have an agenda at the beginning of the process. You want to pillory somebody, or you want to praise somebody, or you want to bring forth your smart political idea. If you just did that, you would be a great disappointment to your readers. That is -- that's lecturing. So sometimes to outsmart yourself, you have to put all your stuff down there, and then feel your own discontent with it as you're rereading, and say, oh, God, if I was a reader, I'd really be feeling condescended to at this point. SAUNDERSThen you come at it again, and you start trying to deepen it. It's really a very interesting dialogue between you and you which simulates the later dialogue between you and your reader. REHMYou know, it's fascinating to me that the writers imagination continues. It seems to me for most of us who are not writers by nature or by training, that that imaginative process comes to a quick halt, and what you're describing is something that just keeps going. SAUNDERSYes. And, you know, the method of reinvigoration, at least for me, is a very intense engagement with the sentence by sentence progress of a story. So for example, you know, often your first sentence will be kind of lame, a place holder. So Bob was a big jerk, you know. Not exactly Dickens. So you say, okay, well, what do the mean? You know, you say to yourself very gently, could you give me a little more information? SAUNDERSSo in the process you'll get more information. You'll also get a better sentence. So if you say, well, okay. Bob snapped at the cashier and made her cry. Now we're kind of getting somewhere. And we say, well, oh, that's too bad. That's too bad for Bob and the cashier. Why -- why do you think he did that? And then you say, well -- and you revise. Bob snapped at the cashier whose way of brushing back her hair reminded him of his ex-wife, or his deceased wife. SAUNDERSAnd suddenly from being a jerk, Bob has gone to be kind of a deep well. He's somebody who's grieving enough to take it out on somebody else. And then, again, here comes plot because now Bob has to come to grips with his grief, or he's going to turn into really a bad guy. REHMSo would you say you do that? You write sentence and then stop, and then think about it, or does one follow another? SAUNDERSIt's always different, but the thinking is the interesting part because I don't -- I try not to think about it as such. In other -- not to conceptualize be logical, but -- and it sounds kind of gauzy, but to have such a relationship to the sound of your own language that it constitutes a different and deeper kind of thinking. You're not really thinking well, I'm trying to make a point about patriarchy, but your just trying to get the sentences to be zingy, you know. SAUNDERSAnd as you do that, sometimes, you know, you'll take a kind of an okay sentence, fairly leisurely, compress it, and find that rhythmically you've made a place at the end for something, and a noun will show up, and the noun is horse, and suddenly you've just made plot. So it's kind of a mysterious but really fascinating process. REHMHere's what I don't get. Prior to becoming a husband and father, you studied geophysics. You worked in the oil fields of Sumatra. So how did that lead to what you are and do now? SAUNDERSSure. Well, I wasn't going to go to college at all. I had a career plan that included, you know, well, consisted entirely of playing in a band that was going to open for a band that would open for the band that would open for the Eagles. So that was a little sketchy. But then these two high school teachers, the Lindblums (sp?) kind of took me under their wings and got me into college, and it was at the School of Mines in Colorado, which is an engineering school. SAUNDERSSo at that point my whole focus was just not to let them down, and stay in school, and try and get a degree. So after four and a half years there, I got out and only then I started to think, boy, I'm not good at this engineering. It's really a lot of work for me. There's no joy, it's all toil. But the only real fun I was having was up in the library. I'd read Thomas Wolfe or Hemingway. SAUNDERSSo I was kind of enough of a lunkhead not to make that connection, you know, if you love something you might want to do it for a living. But I went to Asia and just started reading like crazy. Because we worked four weeks on and two weeks off. SAUNDERSAnd for those four weeks, we were in a really remote part of Sumatra with nothing to do, so you'd just load a bag up with books. And just sort of watching my own reaction to reading made me think, oh, this has got to be in my life somehow. I was -- came alive. I felt confident when I was reading. I felt opinionated and kind of certain. So then it was kind of a long, you know, very uneven road, but I started writing in Asia, really poorly. Kind of all travel logs, but set in a matrix of there's an old guy in a nursing home and he's remembering his youth, of course in Asia, you know. SAUNDERSBut very gradually it started to just be the dominant thing in my life, the most interesting vital thing that there was. REHMAnd then after you came back here you married. REHMYou left the fields of Sumatra. Then you began writing in earnest? SAUNDERSWell, in earnest, but not in quality. I had -- my wife and I met in grad school, and we had this crazy wonderful three week courtship, got engaged in three weeks, and then I was writing, but I -- and by think time finished grad school, but still wasn't really doing anything. I was kind of a Hemingway imitator basically. So the interesting thing is when you have that kind of interest in another writer, you get to a critical moment where there's no intersection between his diction and his mindset, his world view, and the life you're actually living. SAUNDERSSo we were in Rochester and I was working as a tech writer, and that was when things really started to happen. Humor started coming in and the corporate world started coming in, and suddenly I had a little bit of an opinion about things. REHMGeorge Saunders. His new book of short stories is titled "Tenth of December." We'll take a short break here and be right back. REHMAnd if you've just joined us, George Saunders is with me. He's not only an author, his latest book of short stories being "Tenth of December," he's also the recipient of a MacArthur "Genius Grant." And he's a creative writing teacher at Syracuse University. George Saunders, would you read for us from that first story "Victory Lap?' Set it up for us. SAUNDERSSure. This is just a kind of internal monologue from the point of view of this 15-year-old girl. And I do a thing that I call a third-person ventriloquist or it's kind of traditional stream of consciousness except you're constrained by that persons' diction and thought pattern. So you quickly go from sort of outside into her way of thinking and things. So here she's just waiting for her mother to pick her up for a ballet recital and she's sort of just thinking about a few things that are important to her. SAUNDERS"So ix-nay on the local boys. A special ix-nay on Matt Duray, owner of the largest mouth in the land. Kissing him last night at the pep rally had been like kissing an underpass, scary. Kissing Matt was like suddenly this cowl on this sweater is bearing down on you, who will not take no for an answer and his huge cow head is being flooded by chemicals that are drowning out what little powers of reason Matt actually did have. SAUNDERSWhat she liked was being in charge of her, her body, her mind, her thoughts, her career, her future. That was what she liked. So be it. We might have a slight snack, un petit repas. Was she special? Did she consider herself special? Oh gosh, she didn't know. In the history of the world, many had been more special than her. Helen Keller had been awesome. Mother Teresa was amazing. Mrs. Roosevelt was quite chipper, in spite of her husband who was handicapped, which in addition she had been gay with those big old teeth, long before such time as being gay and First Lady was even conceptual. SAUNDERSShe, Allison, could not hope to compete in the category of those ladies, not yet anyway." REHMAnd that is George Saunders reading from the first story in his book titled "Victory Lap." And here's an email on that story from Andrew. He says, "I think Mr. Saunders writes with a sort of literary voice recognizable as being of our time and is reminiscent of other contemporary writers, David Foster Wallace or really anything that gets published in the New Yorker. It seems that when Mr. Saunders writes his story there's still a meter and vocabulary which tells us it's not a 15-year-old girl or a high school boy, but that it's really Mr. Saunders writing the story. REHMSo my question is," says Andrew, "to what extent does he feel he's in control of his own voice? REHMHum, that's a deep one. I'll have the answer about 3:30 this morning. SAUNDERSYeah, yeah. No, I think you are -- I don't know about control. You're responsible for your own voice, responsible for what you call final. So in that sense a writer is responsible for everything that happens in the field of the story, even if you're not entirely cognizant of it as you're doing it. In other words, you sort of have the right of final approval as you go through. SAUNDERSSo what I think I'm doing is I'm doing a very sort of wink-and-nod imitation of a 15-year-old girl, as I said before, sort of channeling up through yourself. But in the end the story is -- it's funny, it's not really a mirror. It's not really an attempt to be real life. It's an object onto itself. And the real function of it is just sort of to be a place where the reader goes into this black box or this sort of area. Something happens. It's nontrivial, meaningful hopefully to the things that are really important to her in real time. And then she comes out the other side somehow energized. REHMBut so many of these stories have these dark elements to them, and darkness is something that certainly teenagers live through. But it's not just teenagers. It's all of us. SAUNDERSNo. I mean, one level, you know, the darkness -- you kind of do what you can do, you know. You might want to be a more light-hearted writer but if it doesn't cohere you don't really have a choice. So you sort of accept whatever offset you have to accept to get some traction going. So if you think the idea a story's sort of a scale model of life as you found it say, maybe a distorted scale model. But for my part the stories seem to work best when there's some -- they're on a sort of catastrophic day or a difficult day, sort of an end condition day. SAUNDERSAnd then my hope is to inject it with some kind of luminosity in the voice and the humor and maybe just the intensity of the experience. That's where the scale model sort of completes itself I think. REHMNow how much time do you spend teaching? How much time do you spend writing? SAUNDERSWell, I teach in the fall at Syracuse two or three days a week. And -- but really, you know, I'm about a three or four-hour day personal writing, so I can fit that in almost anywhere. If I work more I just start undoing the good I did in the morning. So four or five hours a day even -- but, you know, when I wrote my first book I wrote it at work. So I had, you know, shift F3 on the computer so -- and I put my desk the maximum number of steps away from the doorway. SAUNDERSAnd I even perfected a sort of postural adjustment where I'd be working on my story all happy and vibrant. And then when someone came in I'd hit shift F3, slump and frown. And then -- so really that was great training because I can pretty much -- if you give me 20 minutes I can make a little bit of progress on something. REHMAnd you're happy with what you've done in that 20 minutes. REHMYou know, somebody once said to me that you cannot teach someone to write creatively. The only thing you can do is to present that person with creative writing to read. How do you feel about teaching creative writing? SAUNDERSWell, at Syracuse we teach in a really strange, wonderful space because, for example, when I get home next week we have 566 applications to read for six spots. So when these students come to us they don't need to be taught to write at all. They're way ahead of that. The top 50, top 75 applications are amazing. So what we see ourselves as doing is trying to urge them up into that space where they're doing what only they can do, the kind of iconic place, which is quite psychological work. And it's kind of not in your hands. REHMHow much is it the quality of writing and how much is it the depth to which you understand yourself? SAUNDERSI think it's the second, because at that level, the quality of writing is already there. So it's also -- sometimes I've called it a talent for having talent. All these people have talent. Then you're up on sort of the last 15' of the mountain, but it's very -- there's a lot of deep pits there and a lot of walls. So the thing is, how do you negotiate that very last step? And it is very much about being in relation to your own talent, being comfortable with progress, for example. Very interesting work. REHMTalk about your family, your wife, your children. SAUNDERSIn three weeks, yeah. And it was just one of those things, I mean, if -- I don't know -- if you believe that notion of completion or a person completing someone, she absolutely did. There were places I could not have gone in my life unless I'd had her to go ahead and lead me. And mostly it was, you know, letting -- getting true emotion into my work. Not just being clever, not being silly but really stepping up to the big issues and just a constant source of urging me to be my best self and accepting me when I wasn't. That was the thing I couldn't have anticipated at times. SAUNDERSYou know, the notion that someone could know you so well, know everything about you, even the things you would like to keep hidden and still accept you, that's an incredibly empowering, wonderful thing. SAUNDERSWe have two daughters, yeah, 24 and 22. And just to say, you know, that they're the light of your life is to understate it. Just to see these wonderful people and be able to influence them and be influenced by them is terrific. REHMHow did being a parent influence your writing? SAUNDERSIt was night and day. Before that I think I was pretty, you know, clever, smart enough, but I didn't really see the universe as being morally infused. I was a pretty good person but maybe out of habit. I was raised Catholic and I just, you know -- but after the kids were born I had that revelation that, you know, everybody is somebody's kid. And everybody should be as beloved as these kids are. Maybe everyone isn't. SAUNDERSBut then I just found that suddenly morality was everywhere, every -- even the smallest decision, if it affected another human being, came home right away to me. You know, to have these two daughters and think, wait a minute, there's a whole world out there that can either be kind or cruel. And actually we are the instruments by which that occurred. SAUNDERSSo it was really overnight. And suddenly then the work started getting better, I think, because there was nothing trivial there. You didn't have to have a huge, you know, drama. Even if there were two human beings sitting in a room and one was slightly hurting the feelings of the other, that would be sufficient drama, if the person being hurt was your beloved. REHMI'm interested in how you reacted when you heard you were going to be the recipient of a MacArthur Genius Award. REHMTell me how it came. SAUNDERSWell, I was doing a story for GQ. I did a series of nonfiction pieces for them and this one was to drive the whole Mexican border from Brownsville to San Diego. And this day I had been out in the field with those minutemen, the kind of militia guys. So we stayed up all night. They were armed to the teeth. Really, you know, exciting and thrilling. SAUNDERSI think 2005 or '06, somewhere in there. So I came back to the hotel kind of just, you know, elated and wired. And then I got an email from my wife saying, honey call me, call me, call me, call me. And then the next email was from the MacArthur saying, Mr. Saunders, contact us. So -- but it was late, it was 3:00 in the morning. So, ah, I can't do this. So I thought, I wonder. You know, could it be? SAUNDERSYeah, could it be? But, you know, sometimes you get asked for a recommendation. So I went to sleep and had a really telling dream, which is I dreamed that a nun came to me in that hotel. And she said, oh so you think you're getting the MacArthur, do you, Mr. Saunders? Aren't you clever? Do you really -- you know, that kind of thing. Thank you internal psychology. SAUNDERSAnd then so the next morning I called the gentleman and he was completely nice and just said, are you sitting down, and you'll never hear from us again. And that's the way they do it there. It's an incredible organization, such generosity. REHMAnd you never hear from them again. REHMYou get a check in the mail. Do you pay taxes on that check? SAUNDERSYou do, you do. That's the only part I really didn't like. SAUNDERSNo, no, no. You pay, yeah. SAUNDERSBut, you know, it was interesting because it raised the ceiling in all ways, finally and psychologically. You suddenly feel bold. REHMOf course. And you're listening to "The Diane Rehm Show." All right. We're going to open the phones here, 800-433-8850. First to Phoenix, Ariz. Good morning, James. JAMESGood morning. Good morning, Diane. Good morning. REHMHi. Go right ahead, sir. JAMESI wanted to know, George, about, you know, your process, as far as a writer, how do you keep your stories in your mind? I know that, you know, it doesn't get written overnight. And, you know, how do you keep that fresh and able to return to it? SAUNDERSYeah, that's a -- I'm guessing you're a writer, James. SAUNDERSYeah -- no. You know, it's actually -- it's funny. It's a great question and I think, for me, what you do is you don't keep it in your mind. And I think Hemmingway said something like this, like don't -- just leave it behind and let your subconscious chew on it. And I think he advised never think about your stories when you're not in the middle of them. REHMSee, but you've got to trust yourself. SAUNDERSYou have to trust -- and what you have to trust specifically is your day-to-day or minute-to-minute reaction to your own text as you're rereading it. And the idea is to do that in a state where you're not attached to what you did yesterday. So you're really trying to simulate a first time reader, which is impossible but you can kind of simulate it. SAUNDERSSo I imagine that you have kind of a meter in your head with positive on one side and negative on the other. And as you're reading, that needle is -- it's moving and you -- if you're quite enough you can see it. So if you're reading a section and it's up in the positive, you're doing pretty well. And then there on page four suddenly it goes blah, and drops down in the -- but that's good news. That means your taste is asserting itself and you kind of know where to start. SAUNDERSSo to me the trick is to say, I'm not going to think about it, going away from it. I'm not going to have a whole lot of ideas of what I'm doing because doing that will stop you from getting the signal back from the story in real time. If it says I'm flagging here. Can you please do something, your job is to hear that and then, you know, react accordingly. JAMESOh yeah, thank you very much. That's great advice. REHMAll right. Thanks for calling. To Houston, Texas. Good morning, John. JOHNGood morning. This is my pleasure to be here. My son is a junior in high school and he has wonderful ideas on fantasy, of planets with various living objects. But he has trouble. He struggles to write it down. And I'd like to have your advice on helping him -- me helping him potentiate that to the page. SAUNDERSWell, I mean, one possibly cheesy idea is they have this -- you know, this software now where you can just talk it. And that -- you know, that's not a bad way to get a first draft. Have him just talk and you could even ask him questions and engage with him. And then at the end there'll be some text that'll be available for him to work with. SAUNDERSYou know, there -- I -- Linda Berry is a wonderful writer and teacher and she talks about when she was trying to write her first book she was getting blocked with the typing. She'd see the typing and it would make her unhappy with what she had written. So because she's a visual artist she actually wrote her entire first draft on calligraphy paper, beautiful calligraphy paper with calligraphy pens, maybe three or four lines on pages. And she'd just take those and put them down. And in the end she had this towering stack of pages. And by then she was 80 or 90 real pages. SAUNDERSSo I think part of it the game is to be real kind with yourself and say, look writing is weird, it's hard, We're going to do it by any means necessary and we're going to, you know, kind of work with your own psychology. If you have an obstruction it doesn't mean that you're a bad person or you're a bad writer. It just means that's a feature of your process. REHMIs that what you say to your students? SAUNDERSYes, of course. Whatever -- you know, it's whatever they bring -- especially at that level, whatever they bring is an interesting data point. SAUNDERSOkay. So one of the things that good writers tend to do is they do what I call avoidance. You've got a story, you're on draft 97 and it's really getting hot and it's -- you're really getting to emotion core. But your subconscious is not entirely happy. It doesn't -- it has a lack of confidence. It's not sure that it can execute. So often what will happen is they'll put in a spaceship or there'll be a strange flashback, or the diction will suddenly take some weird turn. So part of what we do is just identify the avoidance and ask them to come back to it. REHMGeorge Saunders. His new book of short stories is titled "Tenth of December." Short break and right back. REHMAnd before we go back to the phones, let's have you read from another story. Tell us which one. SAUNDERSWell, this is a long story called "The Semplica Girl Diaries." And it's in the form of a diary, so you'll hear the kind of truncated diction. REHMAnd what does semplica mean? SAUNDERSWell, I'm afraid to give it away, but a Semplica girl is a certain kind of a--well, it's kind of a lawn ornament made out of third world women. I just gave it away. There we go. SAUNDERSBut, yeah, but this is just sort of a set piece from in this diary of voice. SAUNDERS"October 1, Todd Grassberger (sp?) today at Ukrainian Church downtown. Todd, apparently from humble roots. Priest equal long-haired guy in cassock, sings chants, holds service in Ukrainian from memory. As he chants, paces, cassock rope swings. Scary guy, very intense. Sermon, why this surprising? Did you think you were going to live forever? Only difference between you sitting there anticipating the rest of your day and Todd in coffin, bound for eternal home in cold earth, is heartbeat. Feel that people, in your chest? SAUNDERSThat is thin line between you and grave. So why do you live like you are eternal? That foolish. You are fools. This scary? This not scary. This truth. This reality. Shouts, shall we wake up? Shall we? Everyone staring big eyed at priest, except usual congregants who seem to have heard all before. Priest goes on. Which of us will die tonight? Do we think he's being facetious? That shows we are dopes. Anyone of us could die tonight, die right now. Suddenly come up short of breath, keel over and pew, be with Todd in earth in wink of eye. SAUNDERSSuddenly from downstairs kitchen, smell of roast beef. Happy chatter from church ladies down in kitchen. Smell of roast beef plus sound of pots clinking, plates being set out, equal appealing. People shifting in pews due to amazing smell of beef." REHMI can see that priest. I can smell that roast beef. It's wonderful. SAUNDERSThat's good. Thank you. Based on a true story. REHMWonderful. All right. Let's go to Sarasota, Fla. Hi there, Susan. SUSANI'm so happy. I'm in the middle of the book. And I just finished Semplica Girls. And I was so curious about them. As I was reading the story and then finally figured out what they were, but I don't know what they represent. I want to know the idea of it. SAUNDERSYou've got the right idea, which is we don't know. No. Actually, I'll tell you the story. This is a 12-year story. It's not that long, but it took me 12 years. And I'd had a dream when our kids were little. I woke up and walked to a nonexistent window in our bedroom that let me see out onto the backyard. And in the backyard--beautiful fall night--and there were four women that I understood in the dream to be from disadvantaged countries in the third world. And they were hanging on this weird wire that went right through their heads. In one side and out the other on a kind of a swing set thing. SAUNDERSAnd each of them had long, black hair. And the strangest thing about the dream and the reason I went on to write, was the reaction was not, oh, my God, call 911, but oh, I’m so lucky. We finally made it. I'm so glad that I can do this for my family. So I woke up from that and, you know, you'll often have dreams that are just silly, that aren't writable, but that one really stuck with me. So your question is right on the money. For all those 12 years I was trying to figure out, what do those mean? SAUNDERSNow, on one level they mean something very simple, which is oppression of the third world. REHMBut that string holding those girls together. I kept wondering what does S. G. stand for? REHMWhat does S. G. stand for? Who are these people? How did they get this way? Why did they consent to be this way? SAUNDERSWell, one of the challenges of a story like this is that I want to stay in his mind. So he never really would, in his diary, turn the camera and talk at length about this thing that is second nature in his world. So part of it was just to see those hints in there. And I probably had 500 pages of drafts. So I know all the back story and then the trick is to just put a little hint of why they're there. A little hint for the process by which they consented and why. So it's a lot of fun, but it's a lot of kind of lapidary work where you're taking a sentence out and putting a sentence in and so on. SUSANIt does help. And one more thing, I'm glad that I'm not done with the book. SAUNDERSI am too because it's going to be another eight years before the next one. REHMAnd thank you for calling. SAUNDERSBut part of the point is when you're writing, you know, you have an initial idea. And as you complicate it, it takes you into places that you could never have expected. And that always is kind of a deepening. REHMBut that was shocking. It was a shocking story. SAUNDERSFor me, too. For me, too, as I did it, but you get used to it and then, you know, actually what you're trying to do is get this story to be about that one thing and then surprise you by being about something else. Which in this one, that contrasted with the familial warmth. That was a strange juxtaposition I didn't expect. REHMExactly. The father trying to do something for his daughter. Let's go to West Tisbury, Mass. Billie, you're on the air. BILLIEHi. Wow, it's a pleasure to get through and speak to Mr. Saunders. BILLIEHey, a couple years ago, I read another story or personal history piece in the New Yorker about you. I believe it was you. It was autobiographical, growing up in Chicago and working, you know, these jobs. And at one point in the story you talked about, I decided to stop losing. And then, you know, time went by and then I really decided to stop losing. And it just really struck me. You know, I have this posted up in my studio. And just the self-defeating nature of creative types or, you know, these sort of pitfalls that we create for ourselves. REHMI love that word, tickles. SAUNDERSYeah, in my 20s I had been to Asia and gave up that job and then sort of just started stumbling. And every so often I'd say, okay, that's enough. Now, it's time to sit up and, you know, and get it right. And then it would happen again. And so I was a roofer during that period and worked at a convenience store and was a doorman in Beverly Hills. And at some point while I was a roofer I thought, okay, enough. I'm too old for this. And then still couldn't, you know, get on my feet. So it was actually, in retrospect, a great, you know, look into sort of money and the stresses that that makes in American life and that kind of thing. REHMAnd one person, a twittered question, "Why the Tenth of December?" This person is curious because he or she says, "It's my deceased father's birthday." SAUNDERSI just really liked the sound of it. When I was a young writer, I would do things, like you name somebody, you know, Fred Arrogance as a clue or, you know, try to make a really fraught title, but now I'm kind of always trying to avoid a title that conveys too much metaphorical meaning. And I tried other ones and I just really love the sound of the words. REHMNow, I'm going to take you somewhere else because you said in an interview that you used to be kind of an Ayn Rand guy. SAUNDERSWell, when I was in high school and I was making the decision whether to be with, you know, The Eagles opening act or go to college I was reading "Atlas Shrugged." And I hadn't read a novel maybe since third grade. You know, I read "Johnny Tremain." And the book really moved me. Maybe because I was starting to get the feeling that ship of success was leaving the port. I was a bad high school student, was having trouble getting into school. SAUNDERSAnd something about that mindset really excited me, you know, that you are, in fact, the center of the universe. There's a vast hidden machine that's manipulating everything. And somehow it excited that kind of juvenile boy in me that felt slightly left behind, but also it was a novel. And even though I think, in my view now, it's not a very artistic novel, it inspired in me this cheesy vision of walking across a college campus in what I think I thought of a college sweater, you know, sort of like in the old Ronald Reagan movies, and just having a group of friends and having an intellectual discussion. SAUNDERSSo for me, at that point, she was sort of like an Eastern European intellectual. I had never heard any of these ideas, so I was very intrigued. And that book had a lot to do with me deciding to go to college. So then, fast forward, I went to Asia and saw, you know, so much suffering. And unlike in the Any Rand books, these were people who weren't whiners or weren't trying to game the system. They were people working harder than anyone had ever seen and still, you know, I remember seeing at a building foundation, about 200 elderly women who were there at night to clear the site of rumble and so on. SAUNDERSSo even kind of a dullard like me could see that and go, wait a minute, those people actually are victims, they're not whiners, they're not trying to pull a fast one, so in time it was corrected. REHMSo how did that then make you feel about what you had read of her? SAUNDERSYou know, I haven't gone back and read her. And I know a lot of people have taken those ideas and done terrible things with them. And I think she was coming from the Soviet Union, so who knows what her real thoughts were, but I know that what I don't like is the mindset that says, if you have something, you got it 100 percent through virtue by yourself and therefore it's okay for you to be slightly dismissive of people who don't have anything. That seems to me antidemocratic. It's doesn't seem like the most generous vision of capitalism. SAUNDERSSo that part of it, whether it's her idea or a misunderstanding, it turns my stomach a little bit. REHMAll right. To Cincinnati, Ohio. Hi, Tom. TOMHi, Diane. Thanks for having me on. TOM…so and George, every since "Civilwarland in Bad Decline" came out, what 20 years ago now? TOMYeah. I've been giving it to my coworkers and colleagues in community development. We all work in struggling neighborhoods, in struggling cities and I've always found it just a great anecdote for all the efforts we all make for place-making and building up our communities and kind of Chamber of Commerce booster-ism at times. So thank you for that. SAUNDERSWell, thank you so much. Thank you. TOMYou've brought us back down to earth. And I apologize if I missed this earlier before I tuned in, but I've also heard the story several times on NPR about your role inspiring the GEICO Caveman ad, so, you know, whether it's civic booster-ism or its marketing, how do you feel when you're very honest and tragic message about marketing goes wrong, gets turned back around into marketing? SAUNDERSYeah, well, I have a deal with GEICO that I'm allowed to write a novel about a green lizard. So it's kind of a reciprocity thing. You know, no really, it's interesting because I'm starting to think--I won't be able to articulate this, but the way that we make a difference in the world or the way that we affect the world is often really more complicated than we can imagine. You know, you put a book out and it goes out, hopefully, into people's heads. And I'm not sure you can control that. I've certainly had times where I've put a book or I had a story out once where somebody completely misread it and used it as an excuse to put their mother into a nursing home before she needed to go. SAUNDERSSo, you know, I mean, one of the things writers do is we have a shtick about art doing all these wonderful things, but it's interesting, you really can't quite be sure. So you can control your part of it, but you never know what's going to happen on the other end. REHMThanks for calling, Tom. And you're listening to "The Diane Rehm Show." Here's an email, "Does Mr. Saunders meditate? I saw a photograph of his home, many Buddha statutes lined the drive." SAUNDERSYeah, well, my wife and I are both practitioners in the Buddhist Nyingma tradition, but I'm such a beginner that the one thing I know is that I shouldn't, you know, I would be hesitant to talk about Buddhism and such. But, you know, for me, ever since I was a kid, this spiritual life was very interesting. I remember when we were kids in the Catholic church they would have the stations of the cross. And the way we did it, we did it old school, Chicago style, which was 17 hours long or something. But part it was you would sit and then the priest would describe the image. And then the nun would encourage you to imagine, what is Jesus thinking here, what is the bystander thinking? SAUNDERSAnd then, this is pretty radical, what do you think that centurion is thinking, why is here, you know? And that got really in deep, that kind of projective--it's basically fiction writing. And the animating principle is the idea that you actually can empathize with somebody else and you can do it through language. And when you do it, it expands your world for you. REHMSo your world view is now through something different, something that was other when you were growing up. REHMOne quick question and email from Ron in Detroit. "Can you say something about the genesis of this story, 'Escape From Spiderhead'?" SAUNDERSSure. Ever since I was a little kid I was kind of interested in the idea that what you think of as yourself, your personality, your character, can be altered by something very small, like a flu, you know, or some good news or falling in love. That always made me wonder, well, how fixed and central am I if I can get a virus and be totally grouchy. You know, suddenly everything in the house looks terrible. Everyone's terrible. So I had that for many, many years, how would we get that into a story? SAUNDERSAnd then at one point I had written a few stories where the diction was purposely a little damp and a little suppressed and minimalist. And I was just getting a little restless. I wanted to write in a higher register. So these ideas came together. And I was writing in that lower register and I thought, oh, God. I'm sick of this. How can I make an excuse to try to imitate Henry James? And I just thought, oh, he takes a drug. What kind of drug? Well, an articulate drug. So he took this drug called verbal loose. And suddenly then, you can go in a couple paragraphs from low to high and it was just, you know, and then from there the story just sort of laid itself out with a series of drugs that he was given. REHMWell, clearly people have enjoyed hearing you. They certainly enjoy reading your work. I hope you continue to write for a long time. SAUNDERSThank you so much, Diane. REHMHave you got another book in the works? SAUNDERSI've got some pages in the works. REHMExcellent. George Saunders. His latest book of short stories titled "Tenth of December." I assure you worth reading. Thanks for listening all. I'm Diane Rehm.